If you are a Veteran with diabetes, you probably hear a lot about lowering your blood sugar. But diabetes can be difficult to manage. Sometimes your blood sugar can go too low. This can even be as serious as having high blood sugar. So what is the best way to be sure your blood sugar stays at a safe level? It may surprise you to learn that simply talking about it with your health care team is the best first step. Things have changed since the days when patients were expected to just listen to their doctor without asking questions. In fact, your health care team wants you to be a part of decisions to keep you healthy. They are even learning better ways to ask for your input. But they need your help. Let your care team know about any worries you have. Talk about the problems that make managing diabetes difficult for you, especially if you sometimes have low blood sugar. Remember that My HealtheVet helps you keep track of your own Blood Sugar information in the Track Health section. You can enter your own Blood Sugar levels and generate a table or a graph to share with your health care team. Talk with your health care team - they want to know your preferences and concerns! It will help them suggest ways to treat your diabetes that will work for you. Ask them about the signs of low blood sugar and how to treat it quickly. 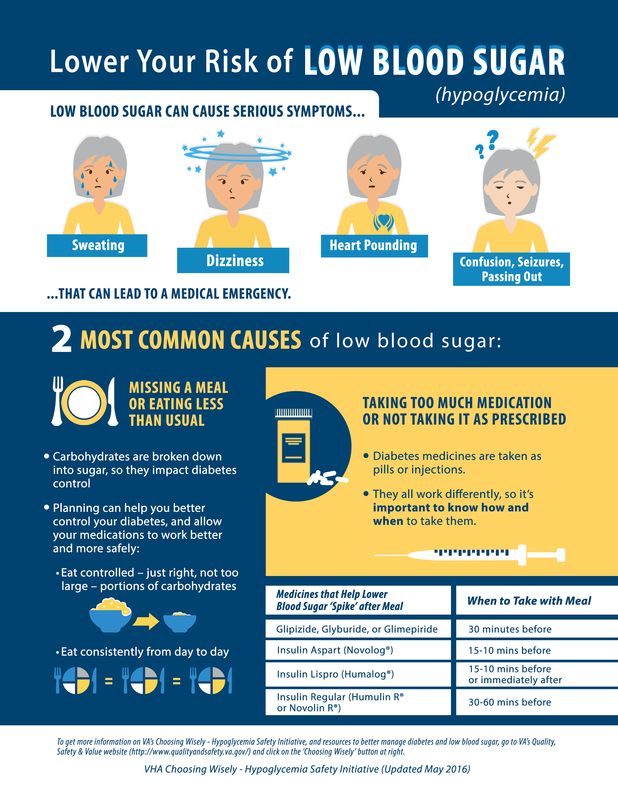 Talk about low blood sugar if you sometimes have it. Ask about ways to take care of your diabetes that may bring less risk of low blood sugar. Medical terms and instructions can be complex and hard to understand. Tell your care team if they have not explained something clearly. It can be hard to remember all your concerns when you get into an appointment. So before your next appointment, make a list of questions to ask your provider. Let them know which are the most important to you. Only you know what works best for your life. Discuss the parts of your diabetes treatment that are working and what may not be working as well.